Not all mistakes are created equal – just ask the Wild Turkey Bourbon Distillery crew who unwittingly mingled very rare, high-proof rye with perfectly-aged bourbon. The result is Wild Turkey Forgiven, the first nationally-available, 91-proof, small-batch bourbon and rye whiskey in the US, according to Campari America. Enjoyed neat or on the rocks, this spirit fortuitously found its way into the whiskey line-up of the Kentucky distillery and the story of Forgiven was born. Despite its accidental beginnings, Wild Turkey associate master distiller Eddie Russell quickly realized that he had an exceptional whiskey more than worthy of bringing to market, hence the name “Forgiven.” Made from 78% 6-year-old Bourbon and 22% 4-year-old Rye, the whiskey opens bold and finishes smooth, with tasting notes of creamy vanilla and oak, and a peppery, cinnamon finish. Like all Wild Turkey bourbons, Forgiven is born from a natural aging process using American oak barrels with the deepest number 4 or ‘alligator’ char that is used to age every Wild Turkey bourbon and rye. 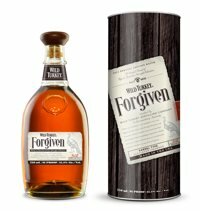 Forgiven joins a growing product line-up that features flagship Wild Turkey Bourbon 81 and 101, Wild Turkey Rye, Rare Breed, Kentucky Spirit, American Honey and Russell’s Reserve. Andrew Floor, group brand director, Wild Turkey adds: “The Rye category is experiencing explosive growth right now, up 44% in the most recent Nielsen figures, with bartenders across the US populating their cocktail menus with this spicy spirit. Wild Turkey Forgiven will be available in limited quantities in the US, Japan and Australia in late summer 2013 with a suggested retail price of US$49.99. Wild Turkey is owned and distributed by Campari.